If You are interested in treadmills, you should pay attention to this equipment. We will consider two similar models, their differences and possibilities of use. Let’s answer the popular question – which one to choose and whether you need to pay more. So we present to you Nordictrack T 6.5 Series Treadmill Review. We have prepared information on the specification of the equipment, the possibilities of its use and advantages. Let’s start reading. This treadmill is available in two versions. Their main difference is the size of the display and the price difference. Let’s compare their characteristics. Their sizes do not differ. You may notice that the weight is slightly different. The rest you get the same opportunities for speed, incline (tilt angle adjustment from 0 to 10 degrees is available), size of Walking Belt. The biggest difference and advantage of the model NordicTrack T 6.5 Si will be the screen size. It’s twice the size. In this regard, the control panel is changing. In both cases, you can control in one click. But with more modern multimedia display, it is more convenient. Using the CardioGrip Heart Rate Sensor allows you to monitor your condition during your workout. You can adjust the load and train with optimal intensity. Many users do not use this feature. But for fat burning it is extremely important to perform cardio training in a certain pulse zone. We recommend you to consider these factors for greater efficiency of your training. The sound system is conveniently located on the control panel. Connect your smartphone and the workout can be accompanied by your favorite tracks. The sound quality is excellent. Ifit support is provided. This system is integrated with both Nordictrack T 6.5 models. For the user, this is a great opportunity to make their training more effective. Ifit subscription is sold separately and is not included in the price of the equipment. This brand has long been engaged in the production of treadmills. He studies in detail the needs of his customers and pays much attention to the usability of their products. Management is intuitive and convenient. But if you have never encountered such equipment for you prepared informative instructions. Using the instructions will greatly speed up the process of assembling the equipment. And also you will not make common mistakes on connecting and configuring the treadmill. An important component of any treadmill is the engine. The key capabilities of the equipment depend on its reliability and power. NordicTrack T 6.5 uses the 2.6 chp drive system. The manufacturer gives 25-year motor warranty. It provides a choice of speeds in the 0-10 mph range. NordicTrack T 6.5 Series provides convenient storage. You can easily fold this equipment. Just lift the platform and move the treadmill on special transport wheels. SpaceSaver Design saves a lot of space when storing your treadmill. And you do not have to allocate a separate place in the apartment for its placement. But it is convenient to train. Larger display size makes the use of treadmill more convenient. But the overall functionality does not change significantly. The difference in cost may vary. But in most cases it is about 1.5 X. it is Necessary to focus on their capabilities and priorities. 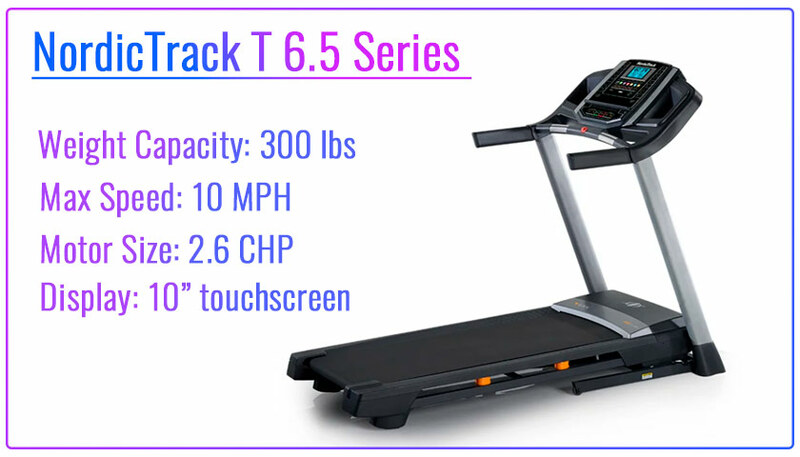 If the price difference is insignificant for you, you should choose NordicTrack T 6.5 Si. The NordicTrack T 6.5 Series is a great treadmill for the home. It is equipped with all the necessary features, provides convenient storage. It is comfortable to train with her. Provided iFit support, 20 preset workouts. Informative display and convenient control allow you to control the process of training and achieve good results. This article caught my attention. Is this really the best treadmill ?